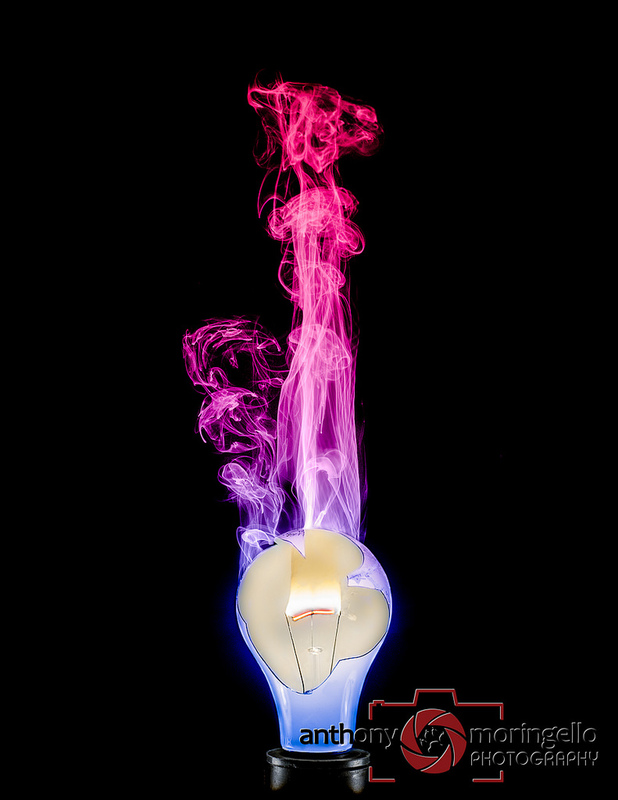 Anthony Moringello Photography: And for my next trick -- Burning Light Bulbs! And for my next trick -- Burning Light Bulbs! It's cool. It's fun. It has an ever so slight edge of danger.... But it can give some fascinating results. 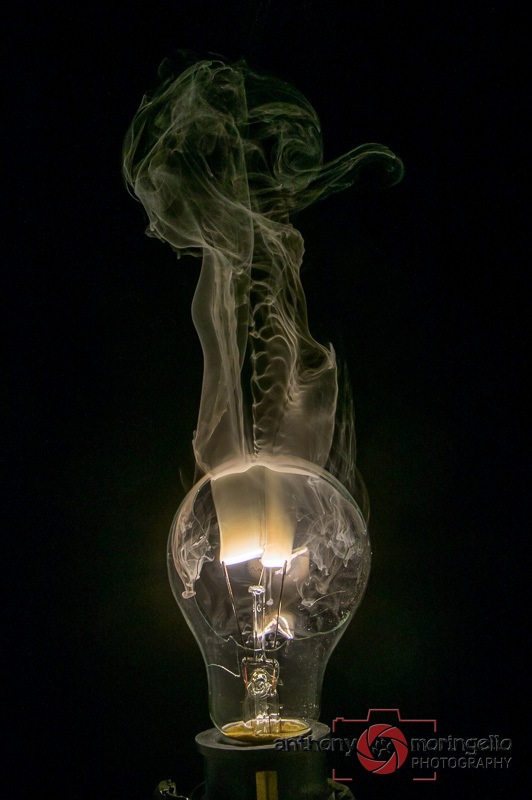 Yes, it is photographing broken lightbulbs. I've been wanting to do this for years. With all of the days off work due to snow this year, I finally got the time grab the necessary supplies gave it a whirl. There is not all that much to it. A little preparation, a little safety, and a bit of luck to go along with it. You are dealing with broken glass, exposed electrical wires (filaments inside the lightbulb). 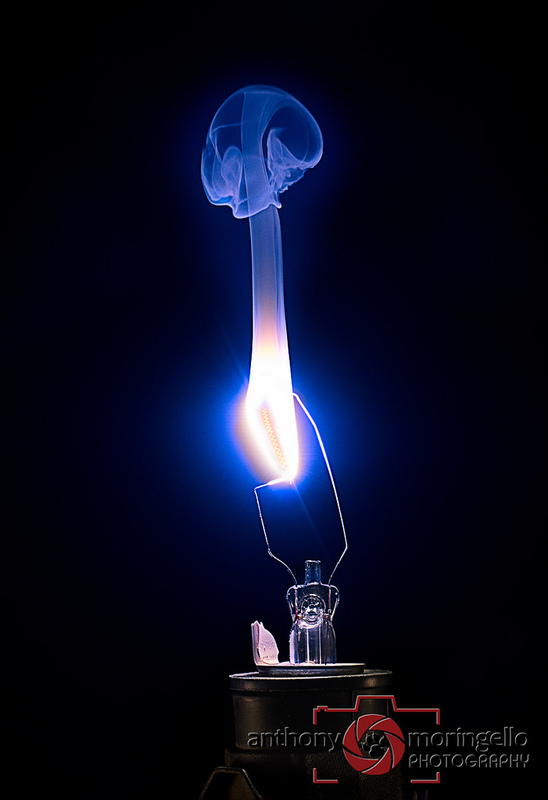 When powered on the exposed filaments do catch fire. There is the possibility of hot wire and hot glass to end up where it is not wanted. Keep the area clear and take any necessary precautions as you would for having an open flame indoors. Ok, on to my lighting setup. 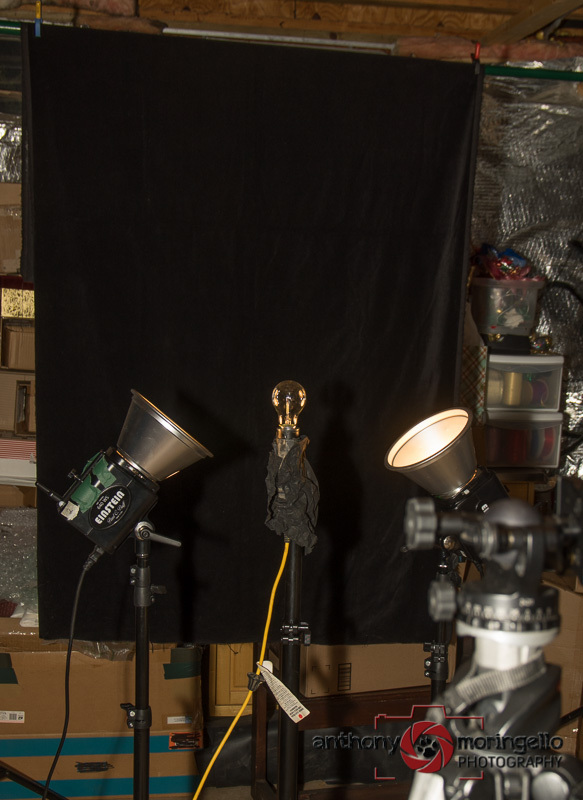 It is a simple setup with a garage light securely tied to a light stand and a black velvet backdrop a few feet back from the light. I have a studio strobe on either side, but only for use of the modeling lights. Any constant light will do. These happen to be 250W each and are brighter than any other lights I own. The brighter the better, as it allows faster shutter speed to better capture the flame and the raising smoke while maintaining a decent aperture for DOF. Note: Use only incandescent light bulbs. 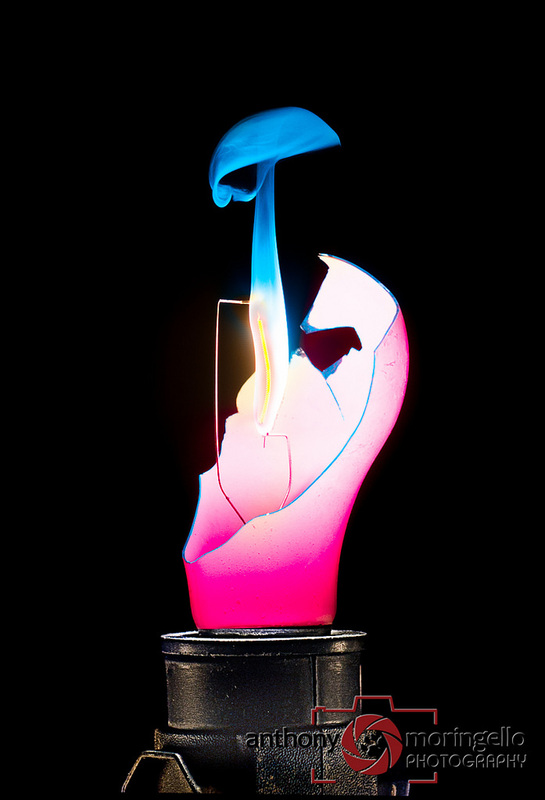 Do not attempt with fluorescent or CFL bulbs. I have used both clear and white light bulbs. Each have their own characteristic that may be useful. Breaking a light bulb is more difficult than it seems. A globe of glass is a pretty durable object. Unfortunately, when that happens, it often results in the entire bulb shattering and subsequently damaging the filament(s) at the same time. It may be difficult or impossible to salvage broken filaments. I have found that using a file to score, or etch, the glass allows the bulb to break more easily and not shatter completely. Just be careful, as scoring too deeply can result in breakage or even crushing of the entire bulb. Just lightly scratch the surface! WEAR GLOVES JUST IN CASE! 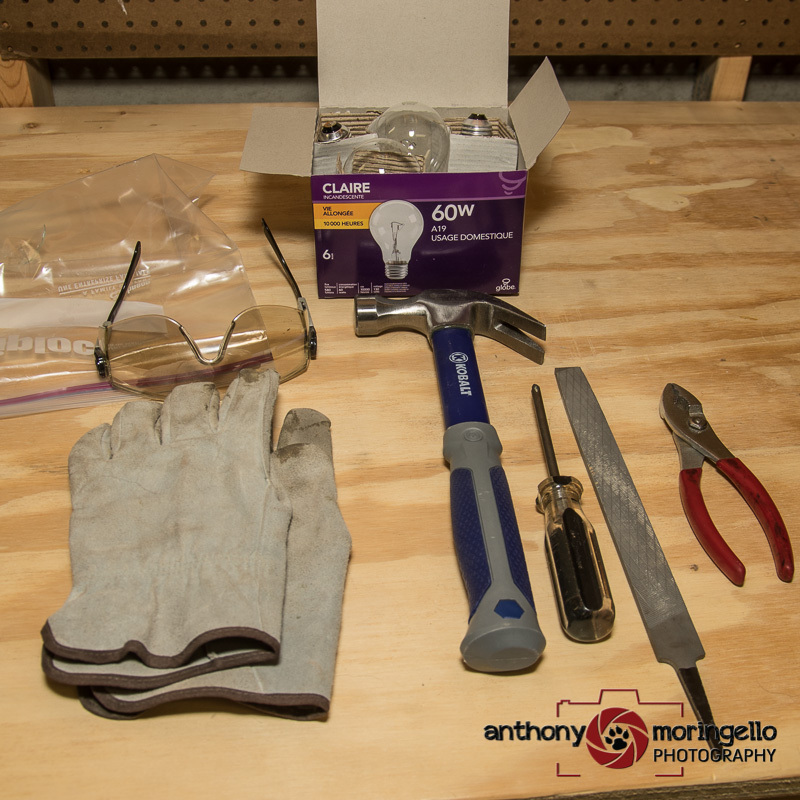 Next, place the scored bulb into the bag to help reduce required cleanup from shattered glass. 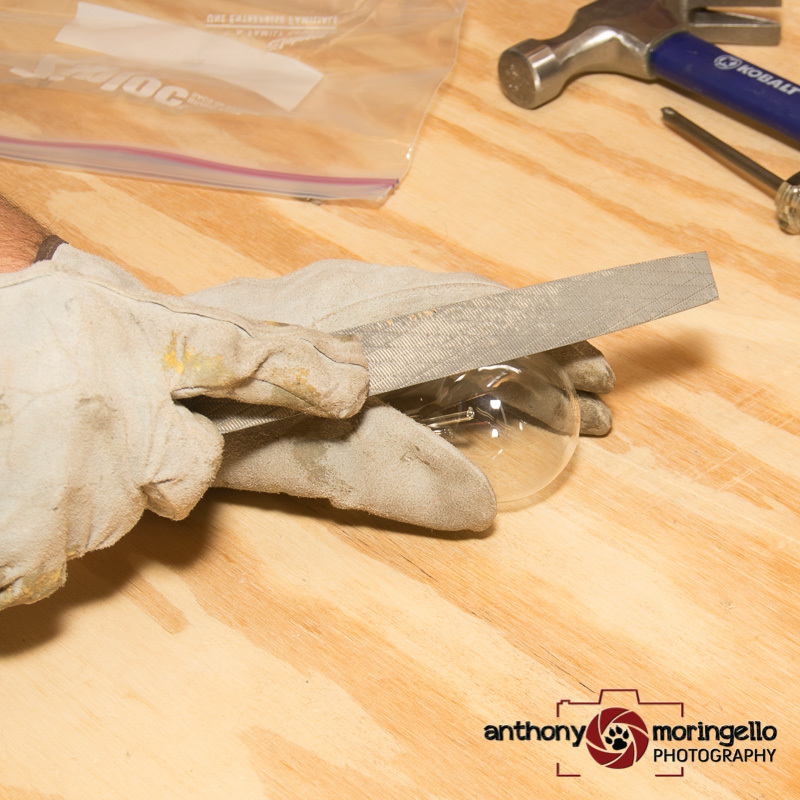 Use the hammer to tap a pointed object, like the tip of a phillips screwdriver, onto the scored area of the light bulb. This will often result in a tiny hole that can be manually enlarged as desired. 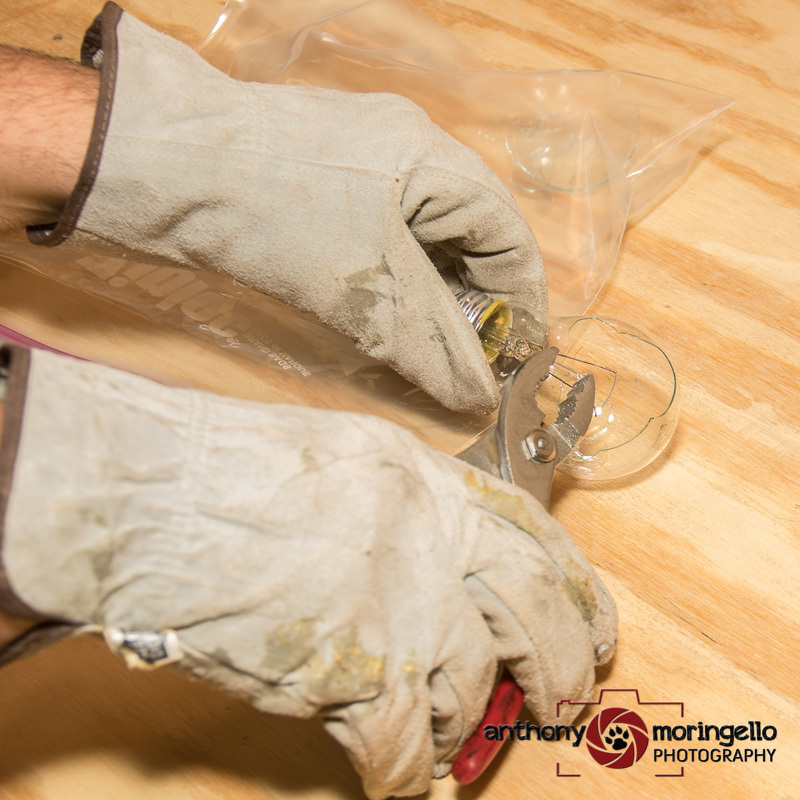 Finally use the pliers to careful chip away at the glass to create the general shape you want. Chip at tiny-tiny bits at a time. Still, the glass has a mind of its own and often breaks in unexpected ways. Part of the magic is that no two will ever be the same. Once you make double-sure that the power to the socket is OFF, carefully screw the bulb into the socket. And you're ready to go! I've found that using the camera's Live View mode helps a lot to ensure perfect focus on the filament. If your camera has focus peeking, even better! I set up my camera with ISO 200-400 at f/5.0 or higher, if light allows it, to keep most of the bulb sharp. I try to keep the shutter speed at about 1/1000s or higher. It reduces the brightness of the flame as well as freezes the smoke rising so it doesn't become blurry. I also set my camera on burst mode to capture the action from start to finish. At eight frames per second, I can capture plenty of interesting moments as the smoke rises around the broken glass. Merging several photos can also make for a more interesting image, so capture as much as you can! Test your focus, and make sure your camera is in burst mode. Press the shutter release just before you power on the socket. Keep shooting until the last glimmer of light fades from the filament. The whole event only takes about two to four seconds. IMPORTANT! Be sure to POWER OFF the light socket before attempting to unscrew and throw it away!! Below is an example I created while taking the example photos for this writeup. You can have some further fun with post-processing, adding color and merging multiple images. So go grab a big'ole box of light bulbs. Be safe. Be creative. And have fun! awesome!!!! thanks for sharing with us! 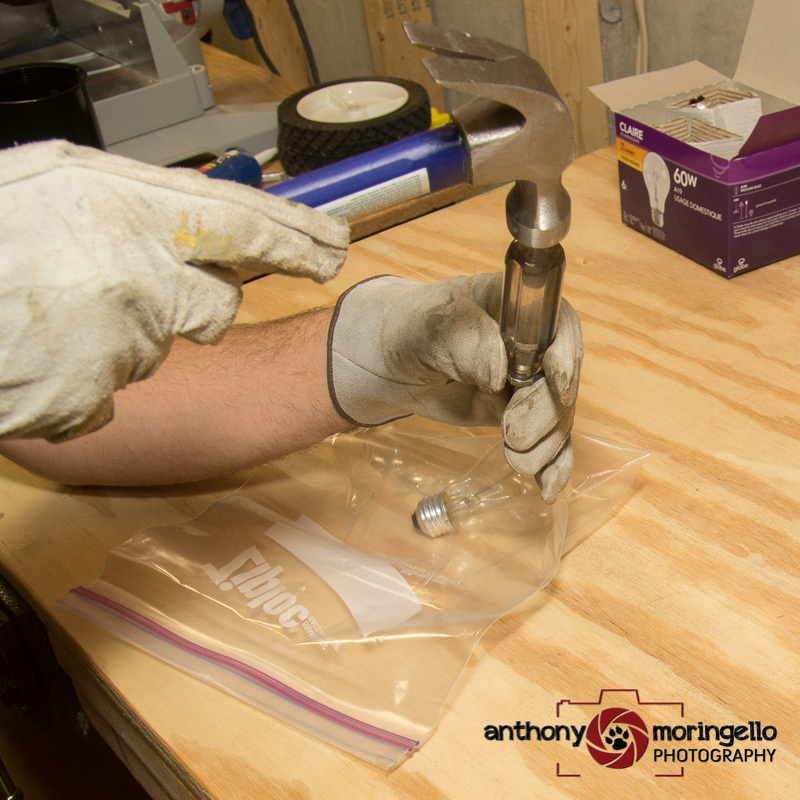 All content copyright Anthony Moringello Photography, LLC . Awesome Inc. theme. Powered by Blogger.